Author(s): Ankur Bhardwaj, Anne Grobler, Goutam Rath, Amit Kumar Goyal, Amit Kumar Jain, Abhinav Mehta. IIPC Lab, ISF College of Pharmacy, Ferozepur GT Road, Ghal Kalan, Moga-142001, Punjab, India. Background: Mycobacterium tuberculosis (M. TB) remains the prime cause of bacterial mortality and morbidity world-wide. Therefore, effective delivery and targeting of drug to the cellular tropics is essentially required to generate significant results for tuberculosis treatment. 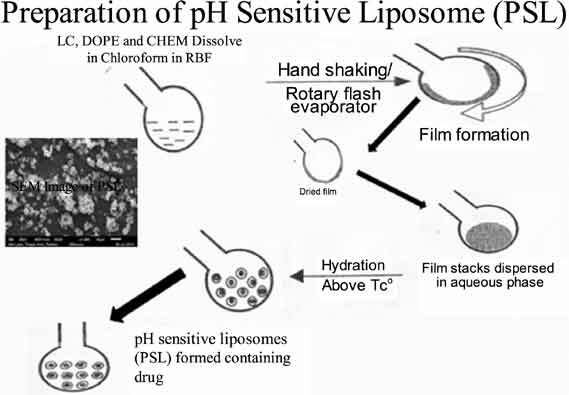 The aim of the present study was to develop and characterize ligand anchored pH sensitive liposomes (TPSL) as dry powder inhaler for the targeted delivery of drugs in the target site i.e. lungs. Method: Ligand anchored PSL (TPSL) was prepared by thin film hydration for the combined delivery of Isoniazid (INH) and Ciprofloxacin HCl (CIP HCl) using 4-aminophenyl-α-D mannopyranoside (Man) as surface functionalized ligand and characterized using different parameters. Results: It was observed that size of the ligand anchored liposomes (TPSL) was slightly more than the non-ligand anchored liposomes (PSL). Drug release was studied at different pH for 24 hrs and it was observed that liposomes exhibited slow release at alkaline pH (58-64%) as compared to macrophage pH (81-87%) where it increased dramatically due to the destabilization of pH sensitive liposome (PSL). In vitro cellular uptake study showed that much higher concentration was achieved in the alveolar macrophage using ligand anchored liposomes as compared to its counterpart. In vivo study showed that maximum drug accumulation was achieved in the lung by delivering drug using ligand anchored PSL as compared to conventional PSL. Conclusion: It was concluded that ligand anchored pH sensitive liposome is one of the promising systems for the targeted drug therapy in pulmonary tuberculosis. Keywords: Cellular uptake, ligand, lung, macrophage, targeted, tuberculosis. Affiliation:IIPC Lab, ISF College of Pharmacy, Ferozepur GT Road, Ghal Kalan, Moga-142001, Punjab, India. Keywords:Cellular uptake, ligand, lung, macrophage, targeted, tuberculosis. Abstract:Background: Mycobacterium tuberculosis (M. TB) remains the prime cause of bacterial mortality and morbidity world-wide. Therefore, effective delivery and targeting of drug to the cellular tropics is essentially required to generate significant results for tuberculosis treatment. The aim of the present study was to develop and characterize ligand anchored pH sensitive liposomes (TPSL) as dry powder inhaler for the targeted delivery of drugs in the target site i.e. lungs.